Welcome to week 3 of the Homemaking On A Dime series! 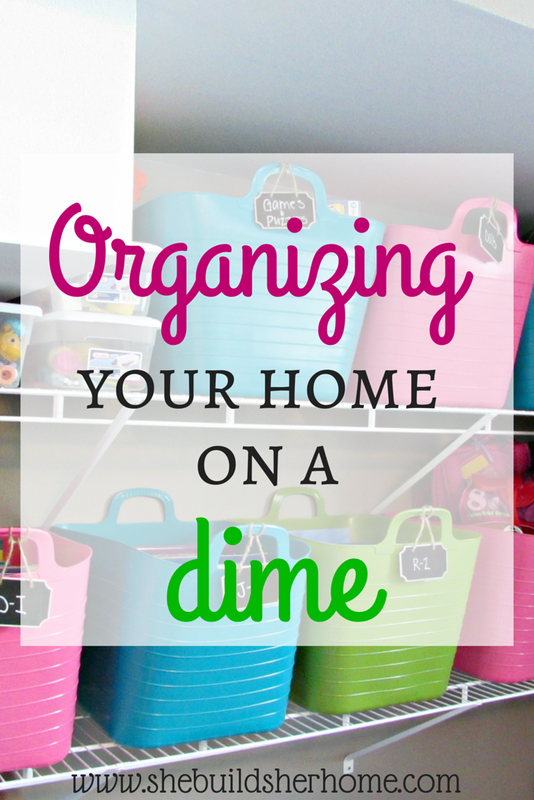 This week we are going to be talking about how to organize your home on a budget. I know that there are so many blog posts, articles, and ideas floating around about how to organize your home, and they all have really great ideas! The thing that I have found when organizing my house is that everything is really particular to your house. What works in your home probably won't work exactly the same way in mine. As much as I want to take someone's great closet organization idea and put it in my own closet, my closet isn't going to be laid out exactly the same way. That can make organizing tricky. You often have to come up with your own ideas and own materials based on your space and budget. Hopefully some of these ideas for doing it inexpensively will come in handy. 97 cent shoe boxes Do yourself a favor and get some of these. No, get a lot of these. I feel like I'm constantly finding new ways to use them and going back to the store for more! At Target, I believe they are 97 cents, and I think they are something like 94 cents at Wal-Mart. You can also get them at the Dollar Tree for $1. A few weeks ago, when I was organizing my pantry, I went to get a few from Target and they were on sale for 75 cents. These are seriously the best! I use them in my pantry for drink mixes, cups and tops for a small blender I have, and miscellaneous. I have them in my girls' playroom for some of their smaller toys like Minnie Mouse dolls, my daughter's Innotab with games, Peppa Pig toys, etc. We have one in our hall closet with batteries in it. I use them under my sink without the lids to organize cleaning supplies. I honestly think I have at least one in every room. They stack nicely too, which is great! Dollar Tree The Dollar Tree has a ton of organizing items. I have gotten things several times for small organization projects, such as little plastic baskets, desk organizing bins, etc. Everything is $1 so I am not spending $20+ to organize one little space, which is great! Target dollar spot If you have never bought organizing materials from the dollar spot at Target, you are MISSING OUT! I have gotten so many little organizing things here and there! My latest and greatest find was these magazine files with a chalkboard label that I use to organize some food in my pantry. 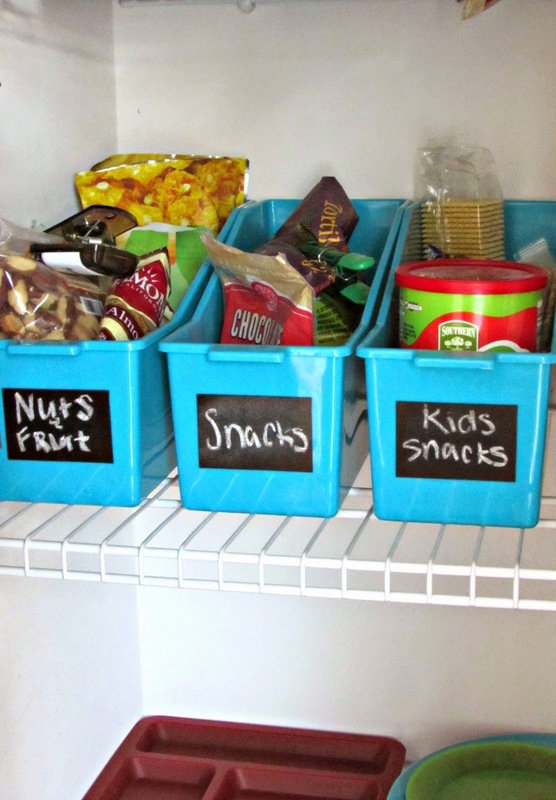 I am waiting on my Target to get more in stock so I can organize my freezer this way, too! I have found a lot of little things here including file folders, notebooks, jars, and random containers. Use wall space Rather than getting some big and expensive organizing system, I highly recommend using wall space to organize. 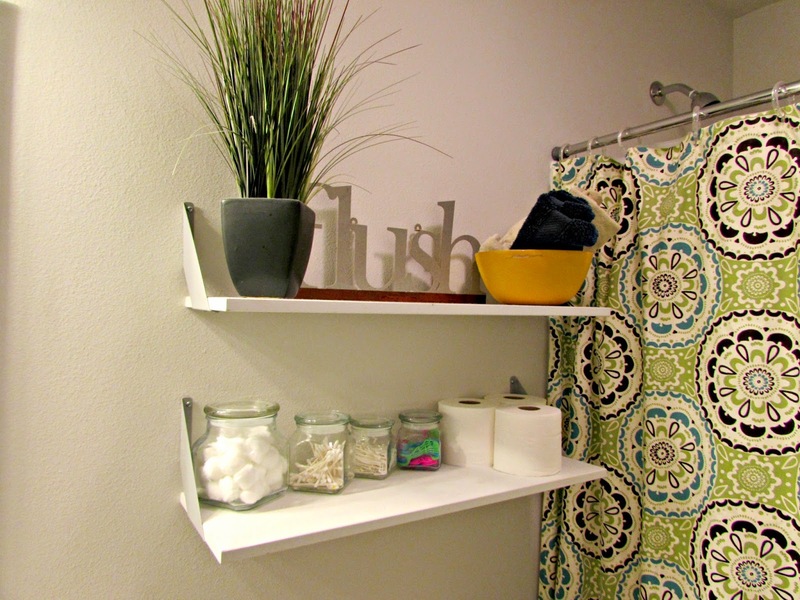 I typically do this in the form of shelves--I love shelves! 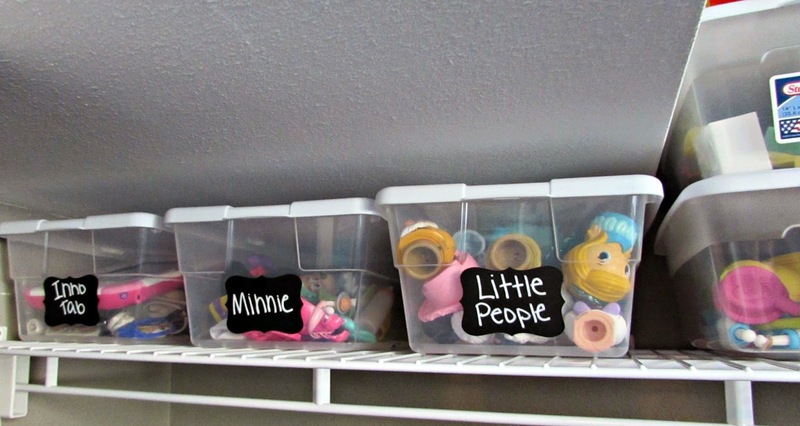 Shelves are great because you can put baskets or little buckets on them, but you can also just do open storage. If shelves are in your kitchen, put some pretty dishes on them and you have decor and organization in one! 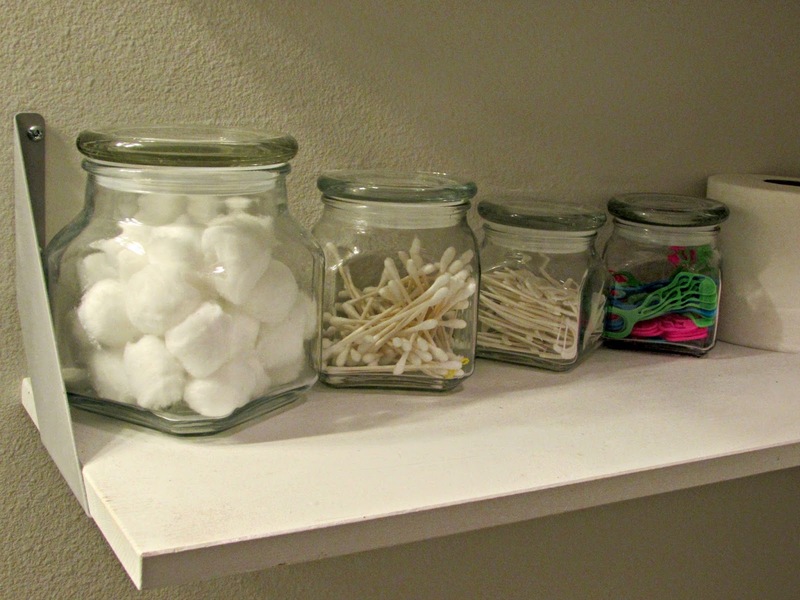 In my bathroom, I bought some clear glass jars from Walmart in different sizes and store some of our bathroom stuff in them, like cotton balls, q-tips, etc. I also have this caddy that I talked about in week 1, from Ikea on a wall in my kitchen, which was inexpensive and organized everything really nicely for me. Be wary of baskets I love baskets as much as the next guy, but you have to be careful with them. Baskets are not cheap, and they add up really quickly. A few months ago I was looking at baskets for a closet organization project, and even looking at stores where I could get discounts (Like 50% off at Hobby Lobby), it still would have been several hundred dollars once I got all I needed. Just be cautious and know that it adds up fast and baskets don't always hold a ton. Get creative It's amazing what kinds of items you can organize with it you just put a little creativity into it. I recently read this post where Amanda organized her junk drawer using items from her recycling bin! Totally free! I'm sure there are awesome ideas floating around all over the internet for this! What other ideas do you have for cheap organization? !